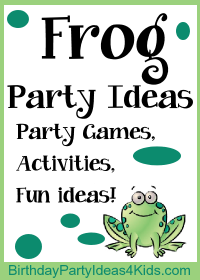 Hop right in to these Frog birthday party ideas! Use these ideas for party games and activities to make your next birthday extra special. Glue large googly eyes onto the front of plain green note cards to look like frog's eyes. Decorate the invitations to look like lily pads. Embellish with frog stickers. On the inside of the invitation write something like: "Hop on over to our lily pad for _______'s birthday party!" Cut out large lily pads from green poster boards and tape them down along the walkway to the party for guests to hop on. Decorate the party table with a sky blue table cloth (water) and solid green plates, napkins and cups (lily pads). Tie bunches of helium balloons in different color greens around the party area. Set up several relay games but instead of running have the children leap over one another or, if playing individually, hop. Have kids place a blown up balloon between their knees. Then one by one they must hop around the cone and back without dropping the balloon. If they drop it they must 1. pick it up and start from where they dropped it or 2. go back to the starting line and begin again. Have the kids balance a green Frisbee (lily pad) on their heads. Dye an egg green or simply use a green permanent marker to color the egg green and have the kids balance the egg on the spoon. Set up a leap frog line (kids on each team on the ground with their hands, feet and head tucked under them) and have the last person leap frog over the team. Then the next person at the back of the line goes and so on. First team around the cone and back to the start wins. Have the guests hop on one foot around the cone and back to their team. Teams race from the starting point, around a cone (or any kind of marker such as a chair) and back using only one more lily pad then the total of kids on their team. This game takes a lot of teamwork! Cut out lily pads before the party begins. Place kids into teams and give them one more lily pad then the number of kids on their team. The team must place the lily pads in a straight line in front of them and then one by one "hop" onto them - one child per lily pad. Then the extra lily pad is placed at the front of the line and the team advances one lily pad. The lily pad at the back is then handed up to the front and it begins again until they are around the cone and back to the start. Float several green Frisbees upside down in a kiddie pool filled with water. Give each child several frogs and ask them to try and throw the frogs onto the lily pads. 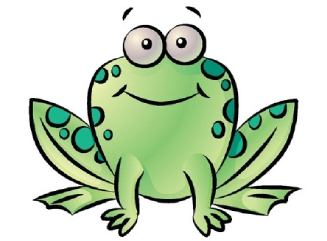 For older children (older then 3) you could use pennies instead of plastic frogs. Bug juice - Freeze ice cubes in an ice cube tray and add one or two raisins to each ice cube before freezing. Pop them out and into glasses just before serving. The raisins look like bugs. Let the kids decorate cupcakes or cookies with green and blue frosting.